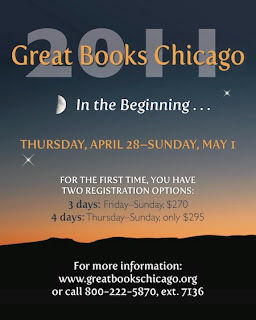 Thanks to everyone who joined us last weekend for Great Books Chicago 2011. The weekend was a success and everyone seemed to enjoy the readings and events, drawing connections between beginnings and history as the days progressed. We started out on Thursday with a panel on the origin of cities. Chicago-based regional planner Alan P. Mamoser moderated this discussion about beginnings as related to urban growth. Other panelists included Carl Smith, professor at Northwestern University and author of The Plan of Chicago: Daniel Burnham and the Remaking of the American City; Charles Daas, who teaches in the urban planning and public policy program at University of Illinois at Chicago and serves as executive director for two local community development corporations; and Ben Schulman, current communications director for the Congress on New Urbanism. Thursday also included a Shared Inquiry discussion from a selection from Lewis Mumford's The City in History and The Culture of Cities and a talk on Sister Carrie and the Chicago literary movement by Paul Durica. Durica is a graduate student at the University of Chicago and his work has appeared in Tin House, Proximity, Indiana Review, and Mid-American Review, among other places. He is also the founder of the Pocket Guide to Hell Tours and Reenactments. Friday began early for our teachers signed up for our accompanying Advanced Institute. 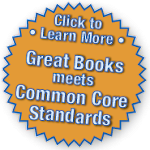 In the morning, they participated in an advanced training to help with integrating challenging longer works of literature into their curriculum. For the rest of the participants, Friday's programming began at noon with a welcome lunch and a talk on science and education by Nobel Prize laureate in physics and author of The God Particle, Dr. Leon Lederman. This talk was followed by a discussion of Genesis and at 7:30 p.m. everyone made their way to the Claudia Cassidy Theater in the Cultural Center for a special performance of The Encyclopedia Show. The Encyclopedia Show was open to the public for $8.00 and the theme was "Creation Myths." This award-winning variety show of readings and music featured GBF's own editor, Rachel Claff, who presented a poem on Michaelangelo's "The Creation of Adam." Longtime Great Books supporter and leader, Kathleen Kirk, also presented a poem on the Japanese Creation myth, "Izanagi and Izanami." Kathleen has provided her own recap of the event on her blog, Wait! I Have a Blog?! On Saturday, GBC kicked off with a discussion of Aldous Huxley's classic novel Brave New World. In the afternoon, we toured Prairie Avenue district, the Glessner House museum, and historic Second Presbyterian Church. On Sunday, the morning began with a discussion of "Tom Outland's Story," a novella which is actually the middle chapter of Willa Cather's 1925 novel The Professor's House. This was followed by a talk on Hindu creation myths by University of Chicago professor Wendy Doniger. Doniger is one of the world's leading scholars of Hindu religion and mythology. 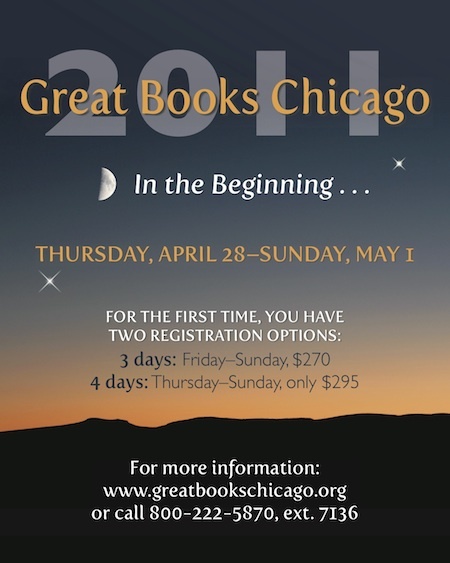 Throughout the weekend, I was struck by the connections to beginnings people made between the texts and events. Whether the beginning of relationships, civilizations, of adulthood, or a literary tradition, there was so much to talk about. What a wonderful weekend. Thanks for the recap, Lindsay! I'm reflecting on it all week in my blog, and the text of the poem will be up on Wednesday!